It was an invite that was very hard to turn down. Nevermind that there was a typhoon, nevermind that it would make me late for work, I will not pass up the chance to watch Varekai. Of course, getting to watch it for free, bring along two friends and get to take pictures of the performers (a big no-no in any Cirque du Soleil show), sealed the deal. Varekai is just one of 19 Cirque du Soleil shows in 2011. Premiered in 2002, it has since toured around the world to more than 15 different countries and 60 cities to an audience of over 6 million. The show is currently touring Asia, with Manila as one of its stop. With Varekai comes the Cirque du Soleil’s mobile village comprising of the Grand Chapiteau (Big Top) where performances are held, the ticket tent where the refreshments and souvenir shops are, the Tapis Rouge where VIP ticket holders can enjoy cocktails and lounge before and in between performances and the artistic tent where the dressing rooms, wardrobe, training area and physiotherapy rooms are. Seeing the yellow and blue tent rising up in the field across the Quirino Grandstand is enough to make one giddy with excitement for the spectacular show. 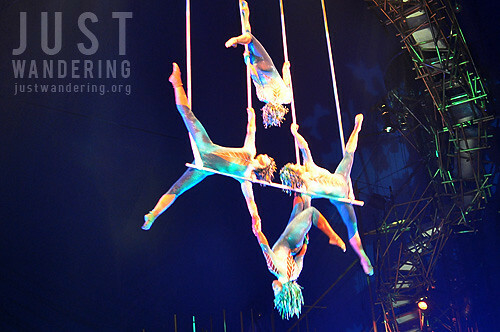 The show focuses on the story of Icarus, who falls from the sky into the mysterious forest of Varekai. It takes us through 13 different acts, with the creatures of the forest teaching Icarus to live, love, walk and fly again. I’m not going to tell you what happens in the show, because it’s best to experience it for yourself. If you haven’t seen a Cirque du Soleil show yet, get ready to pick your jaw up from the floor. If you have, then you know you won’t be disappointed. Let’s just say it was a night filled with awe (at the entire production – costumes, set, original music, performances), wonder (at how the artists are able to do all those things with their bodies) and laughter (at the not-so-typical clowns). 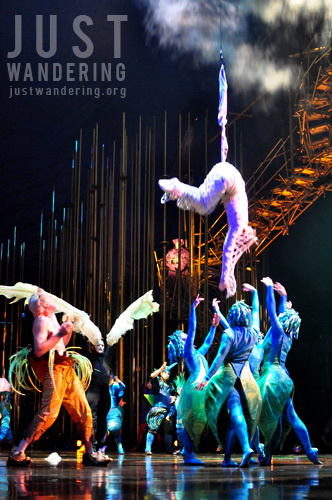 View more photos of Varekai in Manila in the Just Wandering Facebook Page. Manila performances will have a limited run until July 24. For tickets, visit the on-site box office at the blue-and-yellow Grand Chapiteau across the Quirino Grandstand or check out www.hoopla.ph. For more information, contact 775-0939, 881-0947, 0919-4508125 and 0917-4436463. Wow. Kaya pala Awesome ng Awesome si Yagit the other day! Although I watched a different Cirque du Soleil show, I can totally relate with the awe and fascination. Lucky you were able to watch the show in Washington! Sulit no? great photos! i went to my first Cirque show a year and a half ago, and i just love everything about them. This is my second and it’s still impressive! Hello Nina. I saw it in the TV Patrol last night, just a bit of the show.:-). The balance, mind focus and the discipline does matter. Grabe no? Kakaiba ang talent nila! this is what i like about blog-hopping; for a moment i’m gloomy but after viewing this post, i am in awe (actually, envious!). Wow!Ma’am kayo na po yata ang reyna ng mga travel bloggers. I love cirque. I saw Varekai at the Royal Albert here in Ldn. One of my faves! How did you get the permit to take photos? I attended the dress rehearsal, which was the media preview. So there were a lot of media people that were authorized to take photos and videos that night. I didn’t know there was a Cirque du Soleil show in Manila. Amazing! Hope I can watch all the CDS shows!